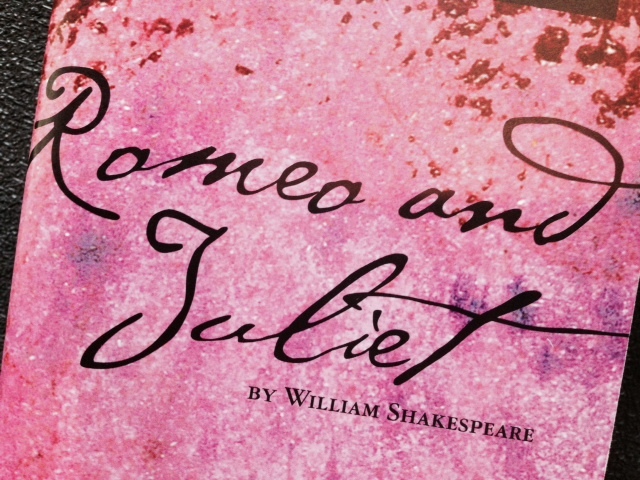 Romeo & Juliet was possibly the first Shakespeare play I ever came into contact with. 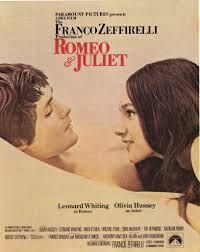 In Franco Zeffirelli’s 1968 Romeo & Juliet. I would have been eleven. And Romeo was also probably the first naked man I ever saw. I just re-watched this movie on iTunes., and it’s every bit as good– no, better than I remembered it. Stunning, the emotion the words and actors are able to convey. It doesn’t seem dated in the least. I also tried to watch the Baz Luhrmann 1996 movie starring Leonardo DiCaprio and Claire Danes, but here I must admit defeat, unable to appreciate the modern setting. Alas. 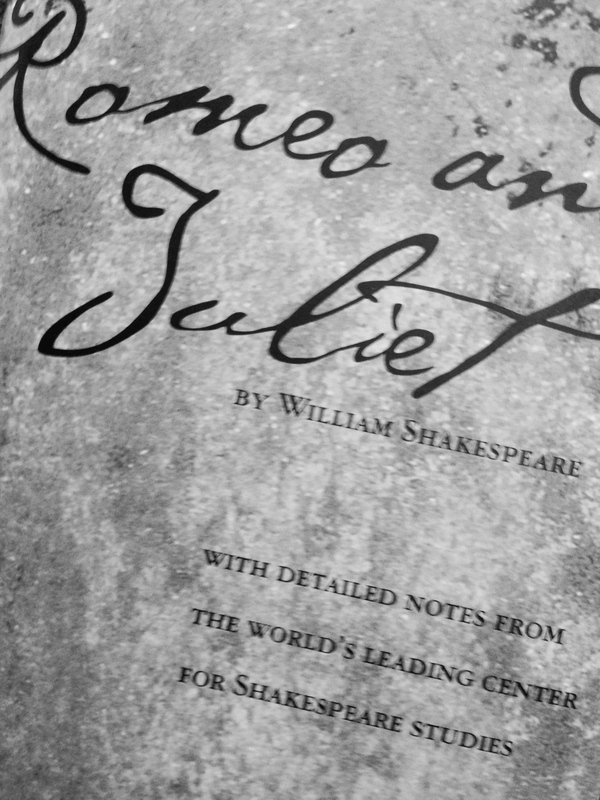 I saw R&J performed live at the Alabama Shakespeare Festival, an abridged version that the company had also taken on the road. It was performed in the Festival’s small Octagon theater. And it was amazing. So, so good. 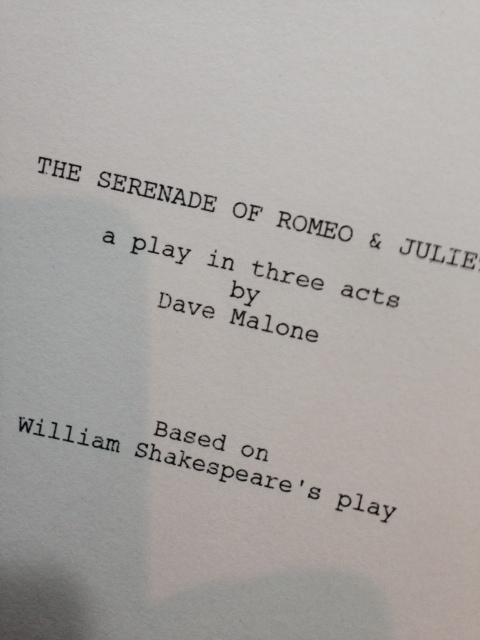 Also also, I read Dave Malone‘s present-day adaptation, The Serenade of Romeo and Juliet. Which he wrote in the 90’s and which I loved reading. I was apprehensive, after not liking the Baz Luhrman, but I did like this. The large flat panel screens in Romeo’s and Juliet’s bedrooms did not seem as invasive as the cinematography in the 1996 film. Here Romeo is a computer whiz with two prosthetic legs and Juliet is a computer nerd with a prosthetic arm. Each dons a neoprene body suit and enters cyberspace. And I loved the ending! Here are two quotes, one of Dave‘s terrific wordplay and the other, his lovely language. All right. I’ll look to like. I already know I like to look. She belongs to books and stars. So many wonderful lines, so little time. Take him and cut him out in little stars. Now onto year two. First up. A Midsummer Night’s Dream, possibly the first Shakespeare play I ever read. I loved your adaptation, Dave. Innovative and far gentler than the Baz Luhrmann. I think it would be quite something adding in the Wii game system. In a first draft of this post earlier today I had your line next to William’s to show how you had adapted it. But that seemed to complicate matters. I enjoyed the comparison. Thanks again for sending me a copy to read. Hope to see it on the stage one of these days. Ha. And I busted out laughing reading your comment, Darrelyn. How cute was he? Leonard Whiting. And Olivia Hussey. A blast from the past. And I loved reading Dave’s adaptation. Wonderful. You might enjoy the BBC’s Shakespeare Retold series of TV adaptations: Much Ado About Nothing, Macbeth, The Taming of the Shrew, and A Midsummer Night’s Dream (see http://en.m.wikipedia.org/wiki/ShakespeaRe-Told). I only ever saw The Taming of the Shrew, but I enjoyed it so much that I intend to buy the DVD box set. Thanks so much for this link. I’ll check it out. Seeing the plays adds so much. love it man!! love it!! I have to say that my husband and I loved Baz Luhrmann 1996 version of Romeo & Juliet. It worked like West Side Story, but truer to the text. R&J was my first exposure to Shakespeare (6th grade?) and I loved it. I enjoyed rereading it when my kids studied it at school in 8th grade. Even my son was moved by the beauty of the language. You highlighted some gems.